Few scientists have bibliographies as extensive or respectable as that of Walter C. McCrone’s. His body of work is a testament to his passions for microscopy and teaching. The cover (right) shows “Stage of Time,” highlighting Walter C. McCrone’s significant events of his career and the organizations he founded. Click on the cover image or above link to read about Dr. McCrone’s life work in The Microscope journal (Vol. 51, No. 1, 2003). Dr. McCrone was extremely generous with his knowledge and time, always being available for his students and to the microscopy community in general. McCrone was not motivated by profit and openly shared his knowledge with competitors, probably because he regarded them as students or disciples of microscopy. McCrone would meet privately with students before the start of class, and on weekends, he traveled extensively giving hundreds of invited lectures and was always willing to write an article at the behest of a journal editor, or teach a specialized microscopy course for a particular company, college class or field of study. 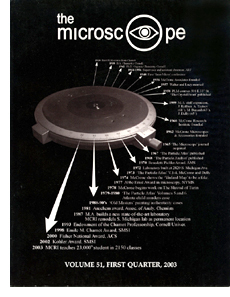 Since 1956, McCrone’s efforts have resulted in more than 28,000 enrollments in McCrone Research Institute courses, clients assisted, a journal devoted to microscopy, numerous awards, the respect and admiration of colleges, and perhaps most importantly the successful promotion of microscopical methods to the next generation. Although we no longer have the opportunity to learn directly from Walter McCrone, his publications provide us with a record of his vast knowledge and experiences. His dedication and hard work continue to inspire us to communicate our knowledge, wisdom and experience through teaching, research and publication.